This review is a part of the 'Casual Collection: May 2011 New Releases' article. 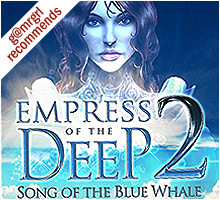 Silverback Productions' Empress of the Deep 2: Song of the Blue Whale, released a year after The Darkest Secret, picks up immediately after the young empress-to-be Anna escapes from her crumbling underwater kingdom. Her mysterious hologram-pal Jacob recounts the events that led to the Ark's destruction and the presumed demise of the power-hungry Pandora before we find Anna washed up on a nearby shore. As play begins, Anna soon makes her way to the literally-named Temple in the Sky, where she must bring together four 'elemental resources' to break Pandora's curse. In a tank in the massive central foyer, Anna encounters the titular blue whale, who also has a request, asking her to free four cursed children and their animal guardians to restore harmony to the shattered world. Jacob is less than thrilled to have Anna's attention diverted, but she's adamant about undertaking both projects simultaneously, all the while faced with the same dilemma as the last time – whom should she trust, if anyone? This sequel isn't very different in either style or gameplay from its entertaining and visually impressive predecessor. But it doesn't just ride on the coattails of success either, amplifying the experience with a more complicated storyline, a larger playing field with several subsections, a more shadowy adversary, double the number of hidden object screens, and an even more visually stunning backdrop. The temple has four large segments linked to the seasons, which must be completed in sequence. Each is laden with colorful and extravagant statues, domes, columns and stairways, along with a lot of intricate machinery. The elemental realms all have their own distinct flavour, from the blinding resplendence of Summer to the dark, icy core of Winter, a frozen land inhabited by cawing ravens. Background music is once again mainly an eerie background hum, though important events are built up through orchestral compositions, and the original voice cast returns to effectively reprise their roles. Anna's quest is split into small objectives like repairing damaged sections of the temple and restoring water supply, electricity and heat to the dead world, most of which require items gathered along the way. Some of these are found in exquisitely drawn hidden object screens, which, though never repeated, are littered with completely random sundries like angel wings, razors and camels. Anna can now carry away multiple items per search, which is useful since she'll typically need to collect full sets of items to proceed. The inventory quests are logical, and the most daunting challenge they pose is the extensive backtracking involved. Hotspots are clearly distinguishable from their surroundings and twinkle frequently to attract attention. Anna's journal records clues to puzzles, though the map is less useful than before, merely serving as a pointer to key locations here. Onscreen, however, completed areas are clearly indicated, which is still very helpful. Standalone puzzles cover common types like sliders, prism patterns, ring rotators and Pipes variations, most of which are quite easy. The worst repeat offenders are several image-flipping jigsaws and closeup-identification tasks that pose no challenge whatsoever. Unlike in most Collector's Editions, the bonus gameplay in Empress 2 is integrated right into the main game. Players can collect eight diary cartridges scattered around the temple, which combine to offer a glimpse into Pandora's disturbing past. The CE also opens up additional sections, including the treasury, which can be plundered via some unexpectedly tricky hidden object searching. But the most intriguing extra is Zem, a deceptively challenging and addictive gem-matching arcade game that has to be unlocked by solving inventory puzzles in the main adventure first. Even without the bonus content, Song of the Blue Whale provides a few hours of quality gaming that is superior to most of its casual peers due to the sheer sensory delight of its sights and sounds, plus its compelling mysteries and charming resolutions. Its tale is as generous as the canvas on which it unfolds, across a world replete with visual grandeur and embedded with a complex mythology that effortlessly blends centuries and dimensions, greed and generosity, loyalty from strangers and betrayals by friends. But if you're up for a little change of pace, the precious little gem called Zem (which might just tide you over till the promised third part rolls out) makes this one of the rare Collector's Editions worth investing in.